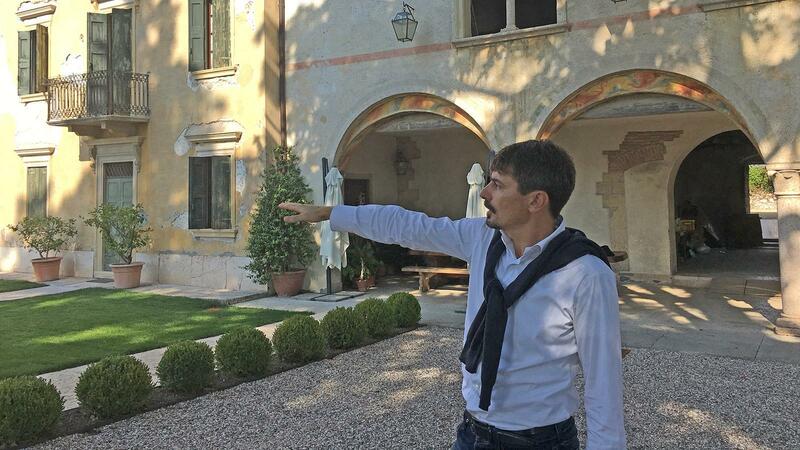 Tommasi president Pierangelo Tommasi looks over the grounds of the historic Villa De Buris, aging cellar for a new Amarone and site of a future hotel and wine bistro. Elite Amarone wines, or any Italian wines for that matter, that command bottle prices around $300 make up a small clique that rarely admits new members. But last week, Tommasi joined the club. The 116-year-old producer, based in the village of Pedemonte di Valpolicella, released the first vintage of a new small-production, single-vineyard cuvée, the 2008 De Buris Amarone della Valpolicella Classico Riserva. “De Buris is not a new high-end Amarone from Tommasi. It’s a completely new project,” company president Pierangelo Tommasi, 43, told me as he strode through a gleaming new wing of the family winery, where workers were still making finishing touches. De Buris is named for the 15th-century Villa De Buris, where the wine debuted Friday night at a lawn party with 250 international guests served by a trio of star Italian chefs. The ornate but timeworn villa, in nearby San Pietro in Cariano, serves as the aging cellars for the new Amarone. In the next five years, Tommasi plans to convert the property into a boutique luxury hotel and bistro co-branded with the wine. For Pierangelo and his eight cousins representing Tommasi’s fourth generation, the long-aged wine represents “the icon of the family”—a family that, under his direction, has aggressively expanded from its home outside Verona to the end of the Italian boot. At the winery, grapes destined for the De Buris single-vineyard Amarone are air-dried for close to 4 months to concentrate the flavors. The seeds for De Buris date back to 2000 when Tommasi purchased Villa De Buris and another property, less than three miles away, in the commune of Sant’Ambrogio di Valpolicella. The 25-acre vineyard, called La Groletta, sits on the southwest side of the hill made famous by Allegrini’s La Grola and La Poja wines. Tommasi soon realized that La Groletta, at an altitude of about 1,000 feet, was its best vineyard. After years of experimenting and replanting the lower terraces with the local varieties Corvina, Corvinone, Rondinella and Oseleta, winemaker Giancarlo Tommasi selected the oldest vines on the upper terraces for an elite Amarone. Winemaker Giancarlo Tommasi celebrates a decade of work at the release party for the 2008 De Buris Amarone. The result is on the more austere and elegant side, defying the stereotype of Amarone as a hefty, slightly sweet wine. Like all Amarones, it’s made from partially dried grapes, in this case dried in an attic on bamboo mats for more than 110 days. But with a vineyard that produces more complexity and aromas than sugar power, Giancarlo, 44, says he aimed for a clean but classic style—structured, without the heaviness of high alcohol. Its 15.5 percent alcohol is restrained for Amarone, which can top 17 percent. The wine is fermented in conical wood vats and is aged more than five years in large Slavonian oak casks and more than three years in bottle. For the 2008 vintage, Tommasi produced about 600 cases and 300 magnums. Since 2008, Giancarlo has made similar quantities of the wine every year, except for rainy 2014 when Tommasi made no Amarone at all. In the cellar, Tommasi creates a more restrained style of Amarone with long aging in large oak casks. Established in 1902 around the family home in Pedemonte, Tommasi is best-known for its range of Amarones, but also makes Valpolicella Classico, ripasso and recioto, plus Soave and other whites. After World War II, up to the 1990s, the third generation expanded the winery and estate to more than 100 acres under vine in Pedemonte alone. The fourth generation created the Tommasi Family Estates umbrella, purchasing five wine estates across Italy—in Puglia, Basilicata, Lombardy’s Oltrepò Pavese and Tuscany’s Maremma and Montalcino regions. In all, the family now has 1,400 acres under vine. “For us, De Buris is a way for the Tommasi family to come back home,” said Pierangelo. Not that anyone really left. Tommasi’s third and fourth generations all live within walking distance of the winery in Pedemonte, along with 16 members of the fifth generation—ages 2 to 21. With wineries across Italy, a pair of hotels and restaurants in Verona and Valpolicella wine country, and more plans in the wings, a lot remains to be done.